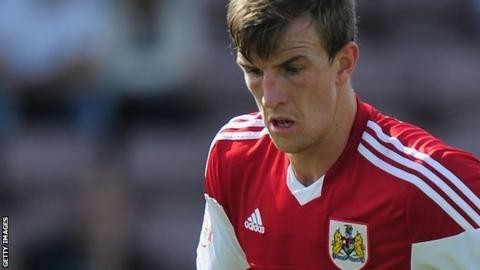 Second-half goals from Aden Flint and Greg Cunningham earned Bristol City victory over Scunthorpe United and took them second in the League One table. Gary McSheffrey went close for the struggling visitors early on with a thumping strike that hit the far post. But the Robins took the lead when Flint nodded Luke Freeman's corner back across goal and into the net. The points were wrapped up when Cunningham ran on to Korey Smith's pass and drilled the ball in from the left. Scunthorpe, who have now lost four of their six league games, drop to third from bottom. "I thought that they were going to be a tough nut to crack, they came here with a few injuries and ended up having two full-backs to try stop Mark Little. "They ended up with a back six - the back four defended within the 18 yard box, plus the two wide men. "It wasn't about going around them, we actually needed to go through the middle of them which we did for the corner that got the goal. "We are pleased that in the second half our performance was upped a lot, but in the first half we needed to think about that situation because we may get that a few more times." "First and foremost I've got to say Bristol City are a top, top team and I think they showed that in patches today but I think we showed what we're about. "We just needed that first goal and we've just got to be a bit more ruthless in both boxes. "It's been a long four weeks to be honest. There's players out there for us who have played nine games in four weeks and I've moaned about the schedule and I think it showed today in the last fifteen minutes." Match ends, Bristol City 2, Scunthorpe United 0. Second Half ends, Bristol City 2, Scunthorpe United 0. Corner, Bristol City. Conceded by Niall Canavan. Corner, Bristol City. Conceded by Lyle Taylor. Attempt blocked. Aden Flint (Bristol City) header from the centre of the box is blocked. Corner, Bristol City. Conceded by Miguel Angel Llera. Attempt blocked. Luke Freeman (Bristol City) left footed shot from the right side of the box is blocked. Attempt saved. Scott Wagstaff (Bristol City) left footed shot from the centre of the box is saved in the centre of the goal. Goal! Bristol City 2, Scunthorpe United 0. Greg Cunningham (Bristol City) left footed shot from the left side of the box to the bottom right corner. Assisted by Luke Freeman. Substitution, Bristol City. Scott Wagstaff replaces Kieran Agard. Substitution, Scunthorpe United. Billy Kee replaces Sean McAllister. Derrick Williams (Bristol City) wins a free kick in the defensive half. Foul by Lyle Taylor (Scunthorpe United). Attempt saved. Aden Flint (Bristol City) header from the centre of the box is saved in the top centre of the goal. Attempt blocked. Aaron Wilbraham (Bristol City) right footed shot from outside the box is blocked. Attempt saved. Niall Canavan (Scunthorpe United) header from the centre of the box is saved in the top centre of the goal. Corner, Scunthorpe United. Conceded by Aden Flint. Substitution, Scunthorpe United. Jennison Myrie-Williams replaces Hakeeb Adelakun. Attempt missed. Derrick Williams (Bristol City) header from the centre of the box is too high following a corner. Corner, Bristol City. Conceded by Robert Olejnik. Attempt saved. Kieran Agard (Bristol City) right footed shot from the right side of the box is saved in the top centre of the goal. Attempt blocked. Kieran Agard (Bristol City) right footed shot from the right side of the box is blocked. Attempt saved. Joe Bryan (Bristol City) right footed shot from the left side of the box is saved in the centre of the goal. Corner, Scunthorpe United. Conceded by Aaron Wilbraham. Corner, Scunthorpe United. Conceded by Luke Ayling. Attempt blocked. Gary McSheffrey (Scunthorpe United) left footed shot from outside the box is blocked. Corner, Bristol City. Conceded by Eddie Nolan. Attempt blocked. Neal Bishop (Scunthorpe United) right footed shot from the centre of the box is blocked.